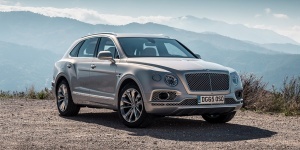 The Bentley Bentayga comes powered by a 600 hp W12 twin-turbo engine and combines fine road handling with excellent off-road capabilities and a luxurious interior for five. Get the best price for the Bentley of your choice from a dealer in your area. Request a price quote now.